Welcome to Star of Saugatuck II boat cruises. The Star is an authentic sternwheeler which operates on the Kalamazoo River, enters into Lake Kalamazoo (how far depends on water levels) where you'll view the quaintness of Saugatuck from the water, heading back down the Kalamazoo River viewing private homes and cottages, boats of every shape and size, and the natural beauty of the Kalamazoo River. On occasion, we’ll catch a glimpse of deer, wild turkey, fox, blue heron, seagulls, and eagles as well as other wildlife natural to the area. As we continue down the river, we enter the cove or basin area, where Singapore lies buried under Lake Michigan’s “living” sand dunes. Traveling along the 2,500 feet of pier head we'll enter the majesty of Lake Michigan (lake conditions permitting). As we travel Lake Michigan’s shoreline, you may be able to catch a glimpse of the “old lighthouse” on the north end of Oval Beach, or make out ‘Big Red’ the lighthouse at the Holland harbor on a clear day, and miles of spectacular sand dunes. We enter Lake Michigan as long as lake conditions permit. This is a trip-by-trip decision when the captain can see the actual physical condition of the lake. If Lake Michigan is too rough, we turn around inside the safety of the piers (we try to make it to the shoreline). We operate daily from the first full weekend in May through until September 30th, and Friday, Saturday, Sunday and Monday’s in October (please check with us for final day of operation). Please see our schedule for departure times. 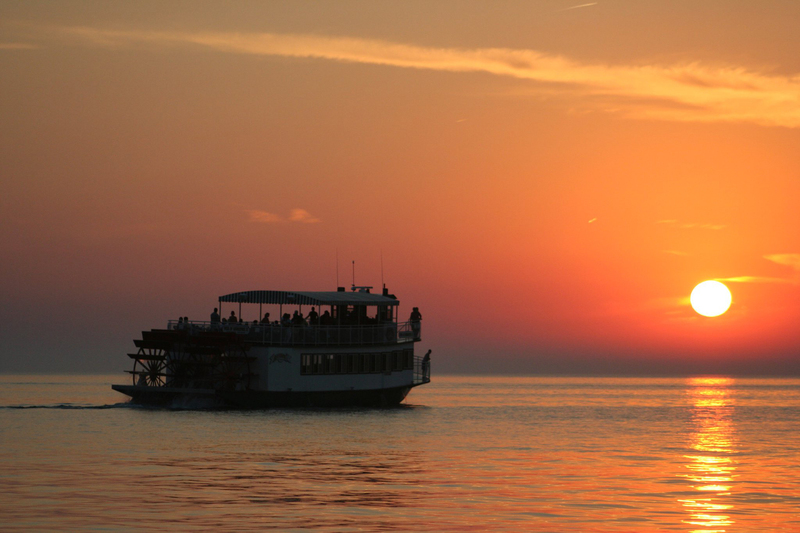 Our evening cruises depart so we may catch sunset on Lake Michigan - as long a mother nature does her job! When we return to our dock it is just turning dusk, and you may even catch a moon rise. The Star II is US Coast Guard certified and annually inspected, and has all its safety equipment onboard – 100% adult and child life jackets, ship-to-shore radios, cell phone, and radar equipped. The Star of Saugatuck II is fun for every age! Children love to be onboard a “big” boat, and listen to the splash of the paddlewheels. Sit back and relax – leave your cares and worries dockside, while you enjoy the beauty and tranquility of the area. Onboard we have restroom facilities which are located on our enclosed lower deck, as well as concession areas on both decks that sell chips, candy, soft drinks, beer, wine, wine coolers, and mixed drinks on a cash basis. The Star is a nonsmoking vessel.